I'm ashamed to say that although I live literally five minutes drive away from Ramside Hall, I had never had the opportunity to visit. It's an absolutely stunning hotel, complete with driving range, function rooms and the newly opened spa and gym; I was really excited to have a look around! Ramside has recently had a £16 million renovation, with £8 million of that being dedicated to the Spa, gym and wellness centre. With Christmas approaching, everything looked super festive too! We met in Fusion, Ramside's newly opened Asian fusion restaurant, where we were given a taster of the winter cocktail menu (sadly I was driving so had to have orange juice!) and left to gossip before our introduction and tour of the facilities. Krissi said her Midouri cocktail was delicious and left her feeling a little tipsy, so it's definitely worth sampling the menu during your visit. Next, we were told about the renovation of the hotel and about the various memberships and spa packages available, as well as some amazing winter offers. I was really surprised to find out that by becoming a member, you get full use of the gym, spa and classes as part of your membership with no extra charges on top-amazing when you think how much a gym membership alone can cost. Ramside also offer Holistic health plans to help you to get the best out of your training and offer a wellness for cancer spa package, so that those who are suffering from cancer or are post-recovery can get the best out of their spa experience too. Then it was time for our tour. We started by going through the gym and chatting to one of the on site personal trainers about some of the benefits of having a Holistic health plan tailored to your needs. The gym is really impressive and even though we visited it at peak time, there were still plenty of machines available, so thankfully it looks like there'd be no fighting for machines there. I didn't feel like it was appropriate to take photos whilst people were working out, but the gym does overlook the spa's amazing swimming pool so it's certainly a workout with a view! Next stop on the tour was the treatment rooms (above). The staff had kindly left some of the doors open for those rooms not in use so we could take a peek inside. 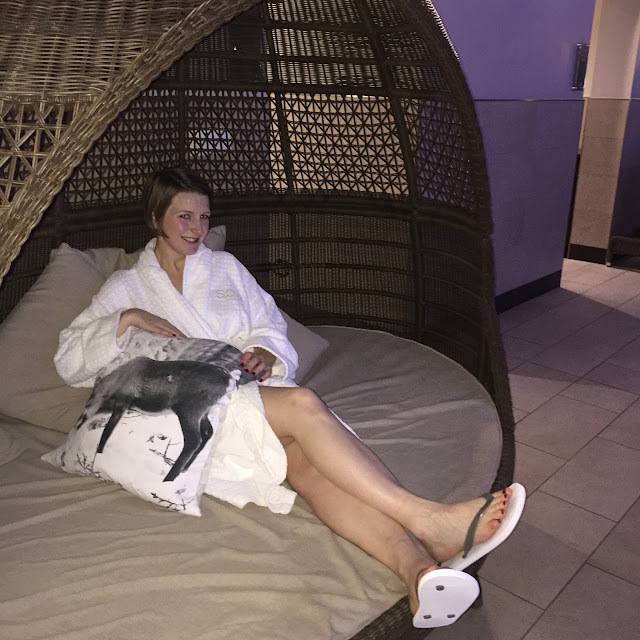 It was so tempting to curl up on one of the treatment beds and relax, but we had so much more to see, including the most amazing nail bar which would be a perfect add-on for a hen party or wedding stay, or to simply spruce up after a relaxing day laying around by the pool. If you're interested in booking a couples spa package or a hen party, there are private rooms available that cater for your needs too and that can offer some additional extras to make your spa even more special. I loved this bubble chair in the private room-I wish I had one at home! Back downstairs, we were given our first viewing of the amazing spa. I was really impressed with the hydrotherapy pool which has different areas to work different muscles in the body; I definitely could do with this after a run! The swimming pool is amazing too; it's just over a metre in depth so perfect from walking offering more hydrotherapy options, but also great if like me, you just wanted a swim but never get the chance to do so! After seeing everything in the flesh, I was ready to jump right into the pool, but alas we had food from Fusion to sample first. The staff had laid on on the most impressive buffet for us to try, complete with duck and vegetable spring rolls, skewered chicken with satay sauce, dim sum, sushi and really delicious pad Thai. I love Thai food and sushi and was so glad I hadn't eaten since lunch, the perfect way to make room for all of the delicious food on offer! After filling our tummies, it was finally time to use the spa. We were each given a complimentary robe, towels and flip-flops, and after being sent away with instructions on how to use the lockers it was time to get our spa on! I spent my spa time with Krissi and Laura, and after taking some obligatory robe selfies, we headed to the spa. We decided to take some photos to show you first, so that we could put our cameras away and really chill out afterwards. We were obsessed with the little teepee type seating and all took turns to cuddle up in one like it was our own little hideaway. The seating was super comfy-perfect for lounging by the pool. The pool was a perfect temperature for swimming, and there's even a jacuzzi right beside it to relax those muscles after taking a dip. and the hydro pool itself! The outdoor hot-tub was amazing even if it was a cold winter evening! We started in the hydro pool; it was amazing! We floated around to all of the different areas and my muscles definitely felt relaxed afterwards. We then went for a dip outdoors, followed by the jacuzzi, the pool, the sauna and the menthol steam room. We had around two hours use of the facilities and it was more than enough time to fit everything in! My favourite was the outdoor area; I loved the hot tub, but I didn't like how freezing I felt on my mad dash back inside after I'd gotten out of it! Thank you so much to the staff at Spa at Ramside and Fusion and Sorted PR for inviting me to take part in such an amazing evening. All of the details on memberships and packages at Spa Ramside can be accessed here and for Fusion here (there are packages available that combine both). There are also private rooms that can be booked for group and couples spa treatments, also accessible online. Wow it looks beautiful, definitely one to add to my spa wish list! Great post - you got some brilliant photos! wow, this looks amazing! Love the look of the food and that little foot spa booth looks so luxurious! Wish I got invited to a spa day.. I definitely need one!